Did you know that reverse osmosis takes all of the minerals out of the water - including the beneficial ones? It's true. And that bothers some people. But the Home Master TMAFC Artesian Full Contact system solves that problem. 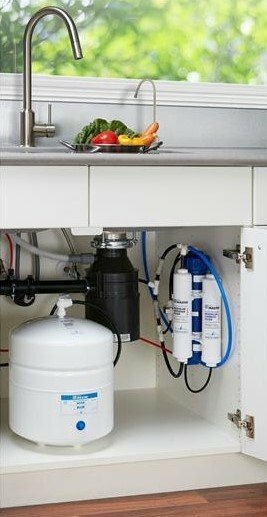 ​The TMAFC is one of my picks for the best reverse osmosis systems of 2017. 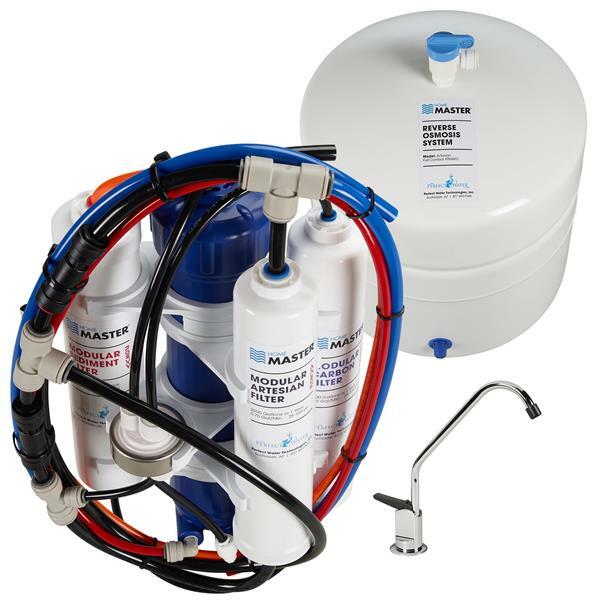 It's a top rated RO system that remineralizes the water to raise the pH and make it less acidic. I've written this in-depth review of the TMAFC to help you decide if it's the best water filter to meet your needs. We'll take a look at the features, how it works, how effective it is, and more. Click here to go to Amazon to see the current price of the TMAFC and any available discounts or coupons. If you don't want to take the time to read my whole review, you can click on a topic in the quick navigation below. Or scroll down to get all the details. What contaminants does the Home Master TMAFC remove? What can I do about microorganisms in the water? Why are minerals added twice? ​What minerals are added to alkalize the water? ​How much water can it filter in a day? How much water is wasted? ​Can I install it in the basement? ​How often do you have to replace the filters? What's the difference between Home Master TMAFC & APEC ROES-PH75? ​Where are Home Master filters made? What kind of warranty does Home Master offer? I always like to see what online customer reviews say about a product. This system has a whole lot of positive reviews! *Honestly, I had a hard time finding anything negative about the Home Master, and I read through hundreds of reviews. A few people had some complaints about defective parts, but those were quickly resolved by customer service. The system is hooked up to your plumbing and uses water pressure to force the water through a series of filters on its way out the faucet. The sediment filter collects dirt, rust and other particles. A coconut shell granular activated catalytic carbon water filter removes chemical contaminants like chlorine, chloramines, pesticides, and pharmaceuticals. The reverse osmosis membrane has 0.001 micron pores that block more contaminants like fluoride, arsenic, chromium-6, cysts, and nitrates. Clean water is able to pass through the membrane. An artesian remineralization and coconut shell granular activated carbon water filter further filters the water and adds natural calcium and magnesium minerals back to the water. Filtered water is stored in a 3.2 gallon tank. When you turn on the faucet, the water leaves the tank and goes through one last stage of filtration. Just before reaching the faucet, the water gets one more small addition of minerals and one last carbon filtering to ensure a clean fresh taste. According to the manufacturer, it "removes up to 98% of chemicals, heavy metals, sediment, and other contaminants that other systems fail to remove." The list of contaminants is way too long to include in this post. You can read it for yourself at this link. Now, I do want to note that although the CDC sa﻿﻿﻿ys that reverse osmosis removes bacteria and viruses, Home Master says that the TMAFC is not rated for removal of bacteria. If you are on city water, this should not be a problem since your water has already been treated with chlorine or chloramine to kill bacteria. If you're not on city water, or if you just want an extra layer of protection, Home Master has two models that include an extra UV filter. Microorganisms like bacteria, viruses, and mold are effectively killed by ultraviolet light, so the water is sterilized. Iron in water will damage the RO filter. Both of these models come with an iron prefilter, making them ideal for well water. Yes, it removes up to 93.9% of fluoride. Water becomes slightly more acidic when it goes through reverse osmosis. Left as it is, it can degrade the rubber bladder in the storage tank. Remineralizing the water before it goes to the tank makes it more alkaline, so it won't eat away at the rubber. That makes the tank last longer and also keeps the water from being re-contaminated. Minerals are added a second time after the water leaves the storage tank, on the way to the faucet. This is to balance the pH and to make the water taste better. Calcium and magnesium minerals from crushed marble are added to the water during the remineralization stages.​ This brings the mineral level up to 30-60 mg per liter. For every gallon of filtered water, 3 to 4 gallons of water is wasted. If you buy the permeate pump for the system, you can reduce the amount of waste to 1 to 1.5 gallons. All reverse osmosis systems produce waste water. That's just how it works. But keep in mind that we're only talking about your drinking water. There's a lot more waste water produced from doing laundry, taking a shower, and flushing the toilet. If this really bothers you, you could consider collecting the waste water and using it for something else.​ Some people use it for watering plants or for cleaning. The dimensions of the filter part of the system are 16” H x 8” W x 5” D. The reserve tank is 15” H x 11” diameter. Reviewers online say that it's easy to install and normally takes less than two hours to do. You'll get detailed instructions with the system. If you need more help, the manufacturer has a series of YouTube videos to guide you. Or you can get live help from their customer service. ​It's designed to be installed under the sink, but you can put it in the basement. There are tips for basement installation at the manufacturer's website. If you're not experienced with plumbing, you might want to hire a plumber to do it for you. The filters should be replaced annually - that's all but the RO membrane. Home Master makes replacing the filter as easy as it can be. The filter and filter housing are one unit, so you replace the whole thing every time. With other brands, each filter goes into a canister. You switch out only the filter and reuse the old canister. Replacement filters are available online. You can click here to check the latest availability and price at Amazon. And you can usually buy replacements directly from the manufacturer. The ​Home Master Model TMAFC-ERP comes with a permeate pump. This is a non-electric device that improves the efficiency of the system and greatly reduces the amount of waste water - by up to 80%. The APEC ROES-PH75 is a similar RO system that also remineralizes the water. APEC has canisters that hold the filters. When it's time to replace a filter, you take the filter out and put a new one into the old canister.​ As the canisters age, they can develop cracks and leaks. Home Master filters and housings are all-in-one. This makes replacing the filters much simpler, and you never have to worry about old canisters wearing out. You can read more about the APEC ROES-PH75 here. The system has a 5-year limited warranty and a 30-day money back guarantee. I think the Home Master is one of the best RO systems available today, and I wouldn't hesitate to recommend it. It's effective, easy to install, and it's affordable. The overwhelming majority of owners have given it a huge thumbs up. The capacity is perfect for an average size family. Customer service is great, and it has an excellent warranty. That gives me a lot of confidence. You can buy it directly from the manufacturer or other online retailers, but you'll want to check on the shipping costs first. Click here to head over to Amazon to check the price and availability of the Home Master TMAFC. If you don't think this is the right RO system for you, please click here to go and see my Top 4 Best RO Systems review.